EDP Vibration platforms are great for larger payloads. The large top surface allows oversized or multiple items to be easily secured and vibrated with amazing uniformity. These low profile shaker tables can be used to vibrate in the vertical direction as well as roll and pitch. Four sizes, factory adjustable to different loads, are available: EDP-1212, EDP-1818, EDP-2424, and EDP-3624 (see model overview below) and follow the links for details on sizes and specifications. Please contact Bartz Technology Corporation for a quote. The patented low profile shaker design integrates the load support stabilizing hardware with permanent magnet electrodynamic shaker technology to provide unmatched cost savings and ease of use. The ED series shakers are prepared to handle everything from small desktop vibration tests to serious production work. Four sizes, factory adjustable to different loads, are available: ED-1, ED-5, ED-10, ED-20 (see model overview below). Please contact Bartz Technology Corporation for further technical details and a quote. Vibration platforms and bench-top shakers of different sizes and configured for different loads. Please contact Bartz Technology Corporation for a quote, indicating the load capacity and head size you require for your experiment. (Please note the US units: 1 lb = 0.453592 kg, 1'' (inch) = 2.54 cm). Engineered from the ground up for unmatched quality and performance, the Crown DSi Series of power amplifiers offers onboard digital signal processing and perfectly matched performance. 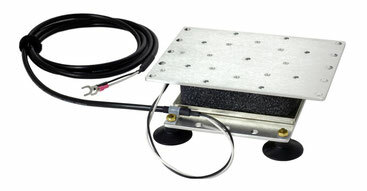 The vibration platforms and shakers are supplied with 1-3 DSi amplifiers (2-6 channels in total; 375 Wrms per channel). Features: Onboard digital signal processing includes crossovers, EQ filters, delay, and output limiting, Switch-mode universal (110-240Vac) power supply, Each amp fills 2U rack spaces and weigh under 19 pounds, Removable Phoenix-style input for analog input signal (1.5Vrms recommended). The amplifiers are only sold in conjunction with vibration plates and shaker tables. Please contact Bartz Technology Corporation for a quote.